Former U.S. Senator Jean Carnahan, D-Missouri, is defending former Vice President Joe Biden, who has been accused by two women of improper touching. 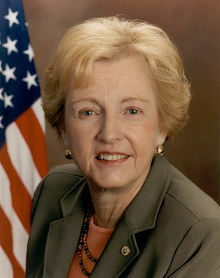 Carnahan served in the upper chamber for two years after her husband, Governor Mel Carnahan, died in a plane crash in 2000. They also lost their son, Randy, in that crash. Biden’s first wife and a son were killed in a car crash before he joined the Senate. In several tweets Tuesday, Jean Carnahan had all good things to say about Biden. Mel Carnahan defeated John Ashcroft in 2000 to take the incumbent Republican’s seat. Jean Carnahan assumed the office after her husband died.